I'm on the couch in my apartment. I've been spending a lot of time there lately. And not just because I've moved out of my bedroom to be closer to the window unit. It's Thursday and I haven't run since last Saturday. I didn't want this break. But I needed it. It was difficult yesterday. The alarm went off at early o'clock and I had to stay in bed. I knew this would be the only way. In theory I could have just not set the alarm, but I didn't have the strength in the evening. I knew the only way to not run was to make the choice in the morning. It is much easier to stay in bed when you are already in bed. 2016 training miles complete with terrifying slowing trend. I needed this break. My body feels tired and a bit worn. I think I am running too much for my body. I am not giving it enough time to recover and build itself back. I'm not running that much, just too much for my body. Or at least that is the theory. But I think it is backed up by evidence. The data are in the charts. I'm getting slower. Three years of miles - and the trend line is still increasing! 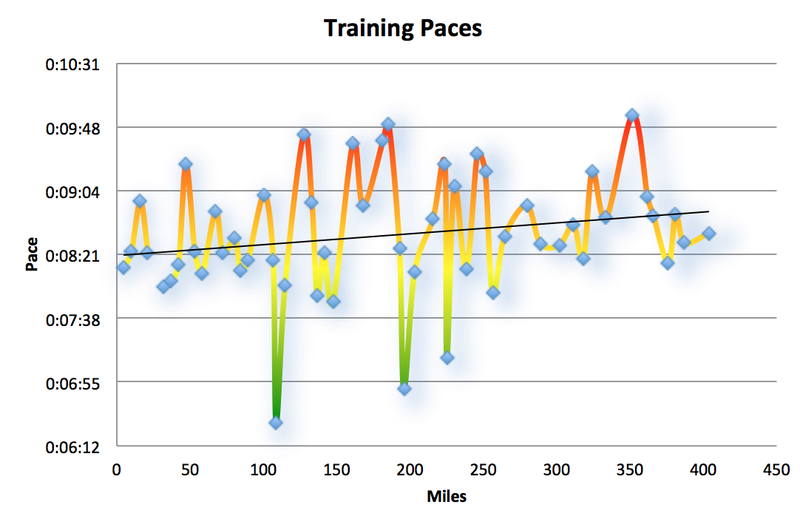 At the last Fred's Team run I mentioned my slowing to one of the coaches. He recommended I take some time off. It made sense to me. 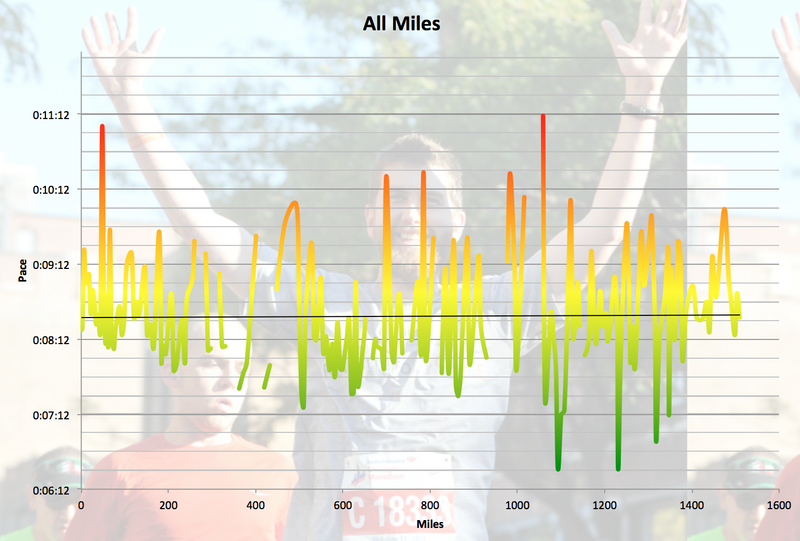 My first year of running I took a week off (or maybe two) due to a foot injury. When I returned to running I felt as if I was giving the same effort. In fact I went out intending to do a very easy run to ease my foot back into the punishing pounding that is running. But when I finished I looked at the time and realized I had run much faster than I had up to that point. Maybe it was a fluke, but my pace improved with a bit of rest and recovery. I hope this will prove true again. This break was hard because August could have had my biggest month yet. 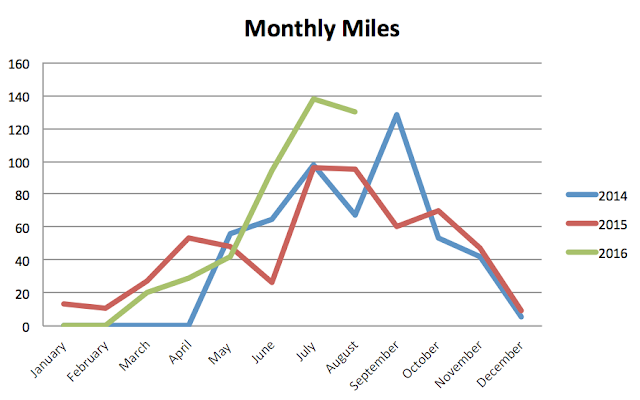 I enjoy keeping track of all my data and I really enjoy watching the miles pile up. And I wanted this month to be the biggest yet. But that is a stupid way to run a marathon. I took this break in hopes that I can have a faster time at the marathon. That is the point after all. But it still hurt giving up the miles.